Size: How to Measure for the Right Chandelier Size? Size is going to be the most important factor in determining whether you’re ordering the right fixture or not for your space. If you’ve been told to buy the biggest you can afford, you’ve been given false information (same goes for the TV!). 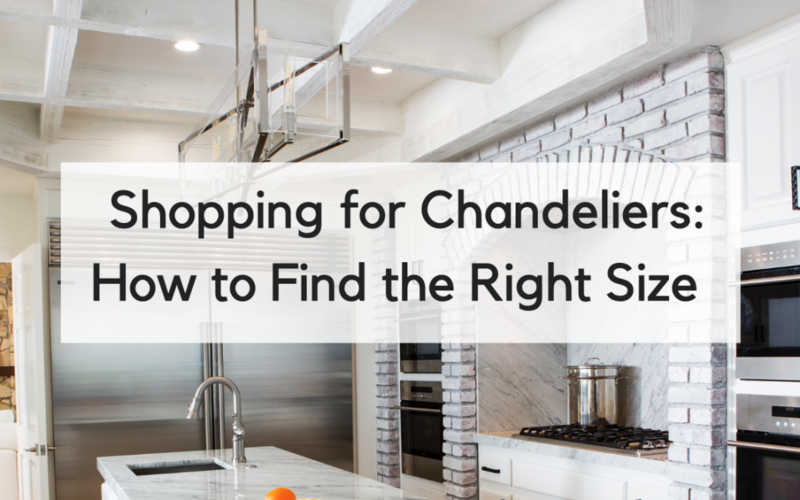 You want to measure the length and width of your room and then add those numbers together: That’s about the size chandelier you want for the space in terms of inches. Chandeliers generally come in pretty standard sizes, though they’ll vary greatly in shape. Chandeliers for small rooms (like bedrooms or powder rooms) generally measure 13”-22”. Medium Rooms (sitting rooms, master bedrooms, family rooms, kitchens) measure between 23”-30”. And large statement chandeliers (for grand foyers, large living rooms, or other spaces with abnormally high ceilings) measure about 31” or more. With your chandelier, you’ll likely get about 10 feet of wire and have 6 feet of chain to work with. How to Mount Your Chandelier? 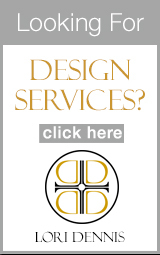 When do you need a ceiling rod adaptor? When your ceiling is sloped, otherwise, if you’re hanging from a flat ceiling, gravity should do the trick and make sure your chandelier hangs straight. You may have heard these terms used interchangeably but there is a difference. A chandelier tends to be more grand and have more moving part or take up more horizontal space and involve multiple bulbs. They’re statement pieces. A pendant generally contains a single bulb and you’ll commonly see two or three pendants hung over a kitchen island, utilized both as task and general lighting at the same time. They’re also often stylish, but certainly prioritize utility first in a way that may be a secondary function of a chandelier. 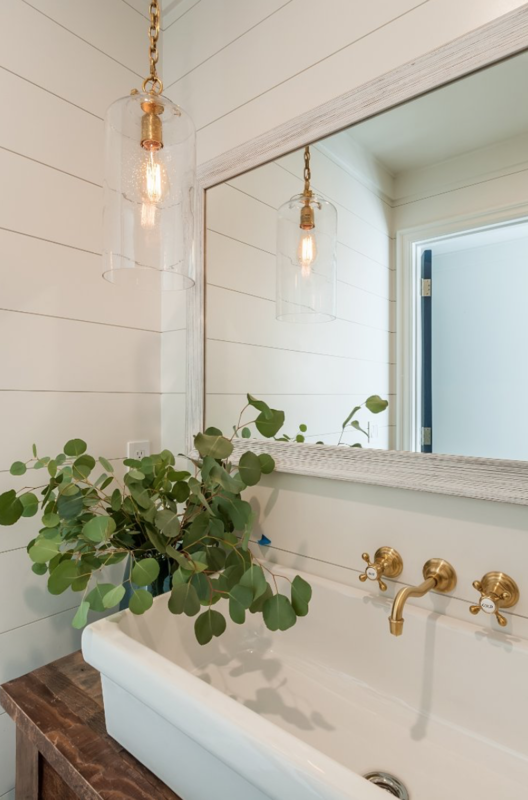 This glass pendant gives the illusion of an exposed bulb in this modern farmhouse bath. Think of lighting, and especially installed lighting like chandelier, pendants, canned recessed lighting, etc, as an extension of the home’s architecture. If the home has an open airy feel, continue that theme throughout the lighting selections and avoid heavy, closed off fixtures or vice versa. You always want lighting to match and/or compliment the structure of the home. Mixing and matching finishes is fine, even preferred to keeping it all uniform. Just because so much of your lighting is one style doesn’t mean you can’t have the chandelier in the finish you want. In this home, you’ll find all sorts of finishes: bronze and nickel, gold and chrome. Sometimes the answer to this is obvious, but sometimes there are spaces you wouldn’t think to install a chandelier or pendant. 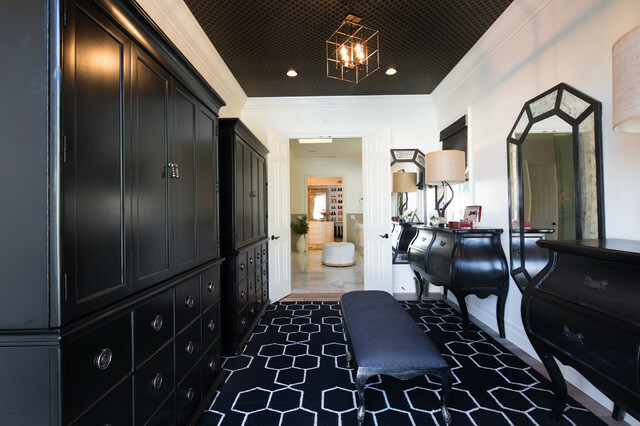 We say anywhere there’s a ceiling is a good place for a chandelier or pendant light! They don’t always have to be statements at the very center of the room, either. 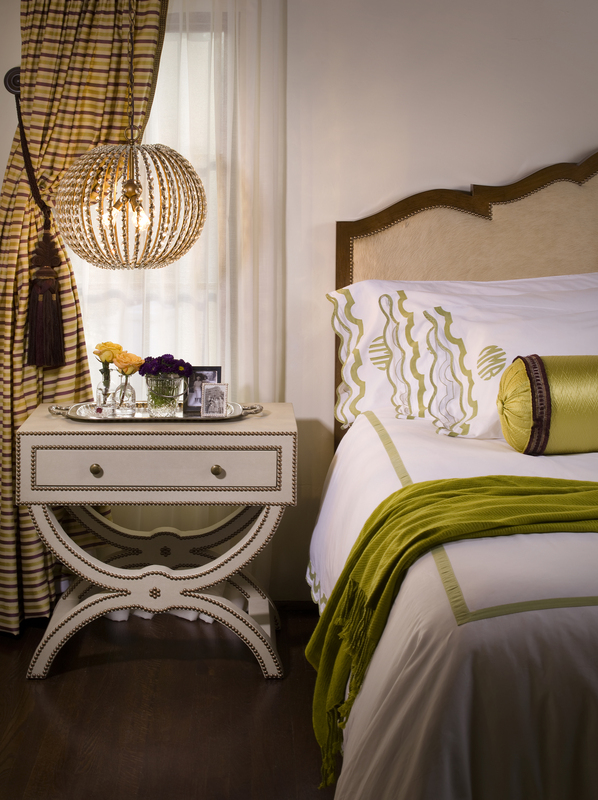 You can hang over nightstands or in a reading nook as task lighting too.